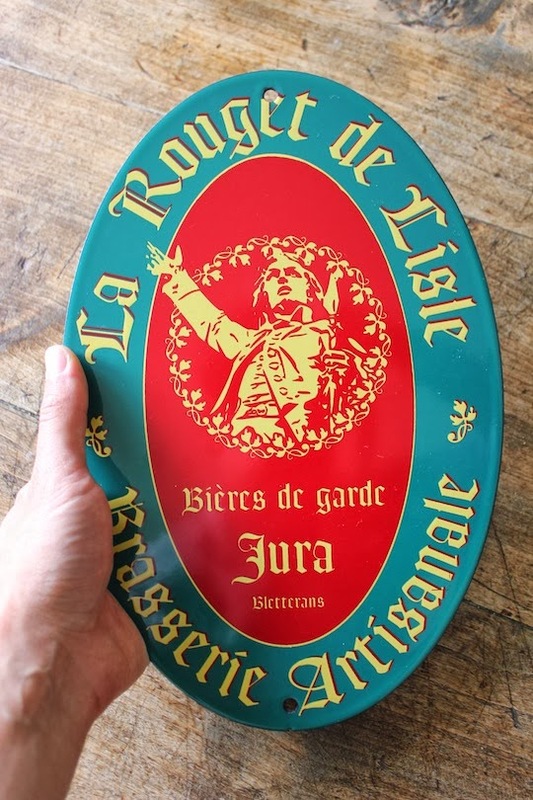 Today, I will present you the brasserie Rouget de Lisle for which we made an enamel plaque playing an important role in its history. Rouget de Lisle is not a brasserie as the others… Set up in the Jura region since 1994, next to Lons-le-Saunier, this traditional brasserie has the particularity of making nonconformist products. Thanks to a touch of originality brought by the creative profile of its manager Bruno Mangin, this former chef draws inspiration from the numerous trips he made but also from its old restaurant where beer was the main product. While beers are often the result of fashion and tendency, the brasserie Rouget de Lisle still have its intact philosophy till its foundation. What is the secret of its longevity? According to me, the main reason would be they are offering us only bottom-fermented beers although top-fermented beer have been democratized and have became fashion in France. On this matter, Rouget de Lisle’s product line is the occasion to break a Dante prejudice! When we talk about bottom-fermentation, the first thing we think is that the alcohol content is low. Yet, we find in Mister Bruno Mangin’s beer, the “black pearl”: a beer reaching 11,5% proof. This is such a surprising as enlightening product. The “Black pearl” will not be the only beer to surprise you. Personally, I advise to all the amateurs of fruity beers to taste the Griottines. This beer is brewed with Griottine juice, a traditional juice made with cherries steeped in eau-de-vie. A dainty and tasty beer in which you will find all the cherry purity without too much sugar or sourness. An experience that worth the detour. Enamel plaque "La Rouget de Lisle"